It’s that time of year again when the wild garlic is out in force. It’s worth knowing how to identify this little herb because it’s a great addition to many a tasty dish, and has long been celebrated for its health benefits too! 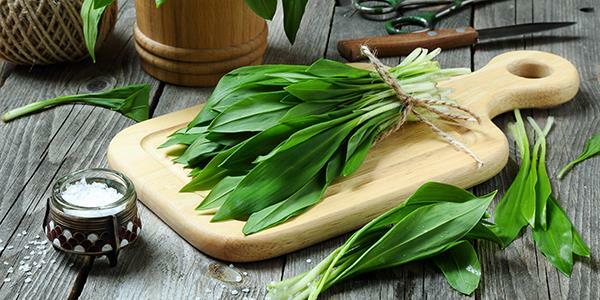 What makes wild garlic so great? It is said that plants of the allium family (onion, garlic, leeks etc) contain medicinal properties. They have been known to help with boosting strength and are even eaten for their anti inflammatory, antibacterial and antiseptic qualities. Those little green leaves are packed full of vitamins, minerals and iron. It's probably for this reason that wild garlic was traditionally eaten to boost energy levels. The iron helps with the formation of blood cells while the vitamins and minerals give your body a bit of a boost; especially this time of year, following a winter of reduced intake. As the delicate, star-like white flowers appear in May, all the plant's energy and goodness is used up in supporting them. So the ideal time to pick the leaves is before the plant has started flowering. March and April are usually a good time to get the leaves at their best. They're likely to smell their strongest at this point, which is what you want. The stronger the better! And they'll still be nice and tender. Allicin is the essential oil released by plants of the allium family, responsible for giving wild garlic its smell. Not only is this pungent oil great for the liver and for digestion, but allicin is actually similar to penicillin in that it slows or even stops the growth of the bacteria that leads to infection! In addition to all of this, alliums contain antioxidants which help in reducing blood sugar levels, blood pressure and even cholesterol! If you want to forage for your own, woodland is a good place to start and deciduous woodland in particular. Wild garlic prefers slightly moist soil and is often associated with bluebells because they tend to grow in similar places, loving semi-shade and river banks. Both species are usually used as an indicator for ancient woodland in Britain. If you find one wild garlic plant, you'll tend to find lots. They grow together and they spread, often forming one giant green carpet amongst the trees. Luckily, round the woodland at Witch's Pool, there is copious amounts of wild garlic so you won't have any problems getting your hands on some. You'll know it when you've found it. Each wild garlic plant usually has one or two large, broad spear-shaped leaves. These begin to sprout in early March and are good to pick throughout March and April. By May the plants start flowering, usually before the deciduous trees come into leaf around them. You'll see an umbel (cluster spouting from a shared centre) of delicate, white star-shaped flowers. Be careful choosing your plants. Wild garlic looks pretty similar to a number of other species that can be found nearby. 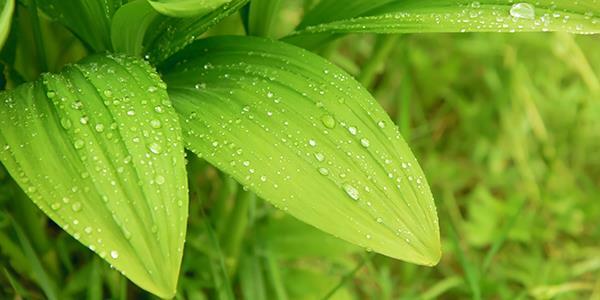 Lily of the valley is a poisonous plant that has a really similar leaf, and even produces small white flowers. If you're unsure, follow your nose! The distinctive garlicky smell of the leaves is even more apparent when you rub them between your fingers. Remember, it's ok to pick foliage and flowers of most wild plants for your own use, but it is illegal to dig them up by the root, simply cut the stems and take what you need. Take small amounts of the plants from different areas, so as not to cause too much disruption. It is the leaf that holds the smell, flavour and goodness. But actually, the whole plant is edible: the flowers make a great garnish for cold dishes while the seeds can add a nice kick to green salads. 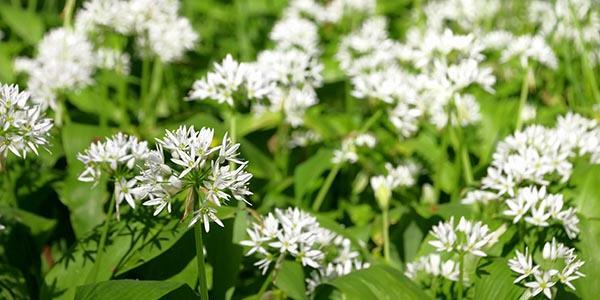 Though not as potent as cultivated garlic, the leaves of wild garlic will have that distinctive flavour and can be eaten raw with salads or cooked. The flavour is more mild and slightly herbier than conventional garlic – similar to chives. A good tip is to keep things simple. The flavour is quite mild, especially when cooked, so use it with just one other ingredient so as not to complicate the flavours. With a squeeze of lemon it is a great one for fresh fish. At Witch's Pool you have a fantastic supply of brown trout and salmon waiting right on your doorstep! 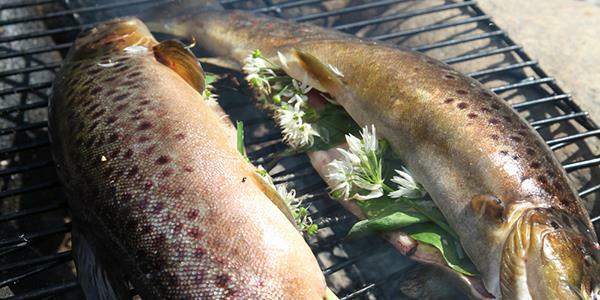 See what fabulous dishes you can create at Witch's Pool with all of the natural ingredients around your property. Find out how to stay here yourself by entering your details at the bottom of the page.